After a period in which the local area appeared to be lagging the rest of London, the latest figures suggest that W3 is at last starting to see prices move up. The average price of a property sold since 1st December was £355,982. This compares to an average price in the W3 area in the fourth quarter of 2009 of £296,365 which is 3.6% down on the same period last year. Volumes appear to be good despite the fact that reported sales at major developments like Bromyard House are thin on the ground. "Prices are heading back up to 2007 levels - generally considered to be the height of the market. This has been caused by strong demand from buyers and a lack of properties for sale. "Now is a fantastic time to sell and with possible uncertainty ahead with the forthcoming election, not to mention the World Cup which seems to slow things down, it is perfect timing if you are thinking about selling. "The market is back again, but not many people know it. We've sold quite a few properties recently where people have gone on the market just to test the waters and then they end up with a sale at asking or close to asking price. "My advice to anyone thinking about selling would be to get your property on the market sooner rather than later." The Land Registry House Price for London in January shows that the capital has been the strongest area of the country during the month with the average price now up by 10.5% compared to January 2009 and 3.9% compared to the previous month. The average London home now costs £336,212. The January data for the whole country from the Land Registry shows an annual house price movement of 5.2%, which is the second month in a row in which the figure has been positive. While not all regions are recovering at the same rate, it is clear that overall prices are increasing. Monthly house price change is also positive this month at 2.1%. This is the eighth consecutive month that the figure has been above zero. 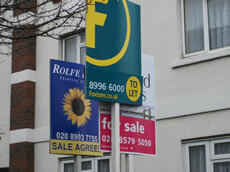 The average house price in England and Wales now stands at £165,088.